So, You are probably wondering what is EuroKac, It is my own fictional company in ETS. 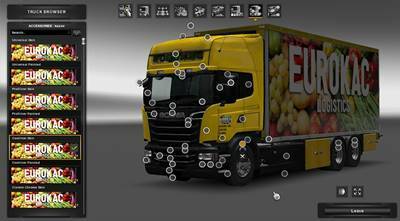 This is a EuroKac Mega pack with a lot of custom parts like tandem, skins and trailers. This mod now contains tandems and you do not require the BDF Tandem Pack by Flemming V anymore. – Mod needs going east and Scandinavia to work. – A big thanks to Flemming V, RJL, Capital and MDMODDING for making this mod possible. Tested V1.27.0.8 or something like that ? The reason the mod is so big is because I added so much new things in the latest update. I worked really hard on it, took me a few days to get everything to work properly. So here it is. 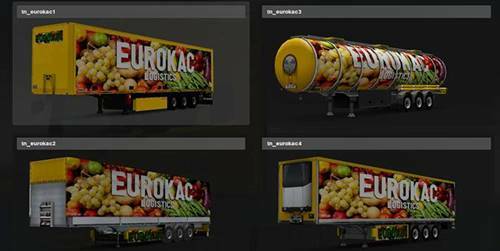 – Added new Eurokac skins for all trucks. – Added new trailers such as a curtain sider and a container. – Corrected the Eurokac cooliner textures. PLEASE KEEP IN MIND THAT THIS MODIFICATION TOOK ME A FEW DAYS TO MAKE AND HAD TO FIX UP THE DEF FILES. DO NOT REUPLOAD, KEEP ORIGINAL SHAREMODS DOWNLOAD LINK. IF YOU DON’T LIKE IT THEN YOU DON’T HAVE TO USE IT.